It’s been a pretty solid snow season wouldn’t you say? It seems like we’ve had the good fortune of forecasting storm after storm this year. And it looks like for these least these last two posts, we’ll have the opportunity to do the same! Today saw mostly cloudy skies over most Utah ski locations with a little bit of snow falling in the morning and early afternoon hours as a weak shortwave moved into and has lingered over our area. Snowbird and Alta have reported 2″ over the last 24 hours, with little to no accumulations reported elsewhere. A shortwave that has been moving across the Gulf of Alaska will push into the Pacific Northwest on Monday, and into the Intermountain West by Tuesday morning. This should bring another round of fairly significant mountain snow into our Utah ski locations. 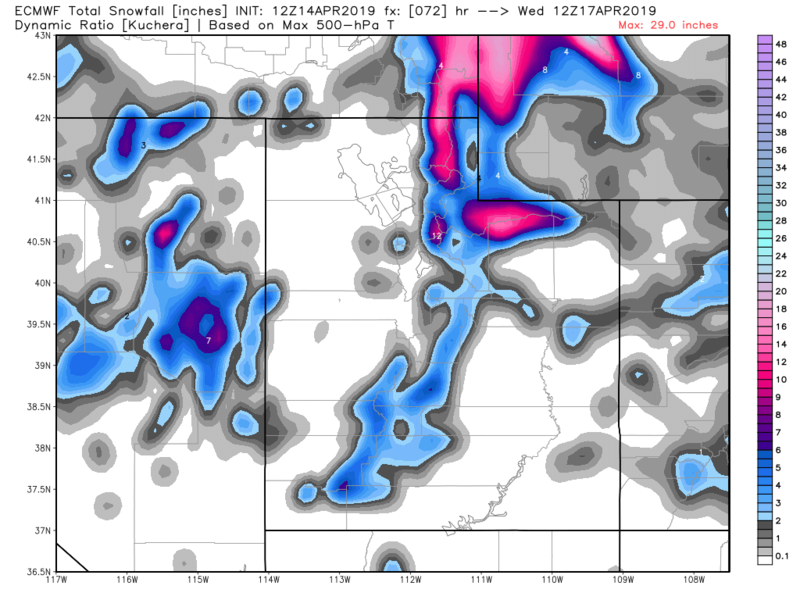 Through Wednesday, expect 10-14″ in the Cottonwoods, and 7-11″ for Snowbasin. Below is a map of the ECMWF 72 hour total snowfall forecast. As I said before, this has been a pretty nice year overall for snow. That is proven by looking at SNOTEL data below showing that many mountain locations are well over 100% of normal in terms of snow water equivalent. That’s pretty impressive! I hope you all got to enjoy the snow out there this year; I know I have. It’s been fun forecasting for y’all this season; I hope our forecasts have been helpful to most of you out there. Take care and be safe as we transition to summer sports season! Hope you had a chance to get out and ski this week because an April storm like this doesn’t happen every year. Snow fell right side up (wet to dry) over the course of the wintry period, making the drive up canyon well worth the powder day. 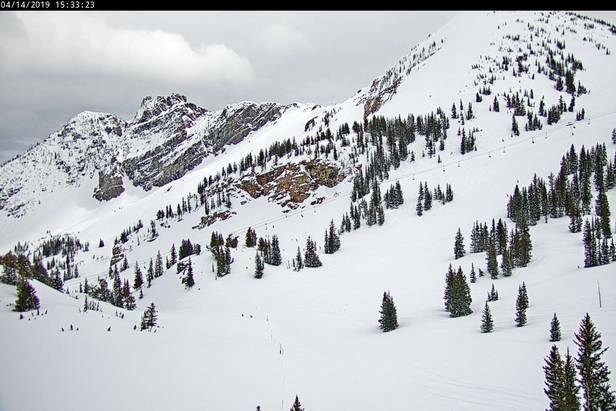 In fact, Snowbird broke 600″ this week, and Alta isn’t far behind. We’re likely going to finish with the 2nd snowiest season of the last 10 years (the 1st being perhaps 2010/11 by a long shot). Here’s a brief and spotty summary of storm totals this week. These data don’t cover the entire period but two periods (Tuesday PM thru Wednesday PM; Thursday AM thru Friday AM) of the storm, so complete storm totals are possibly a few inches more than the sum of totals from both periods. The rest of April is more of a dice roll in comparison with the first half of the month. 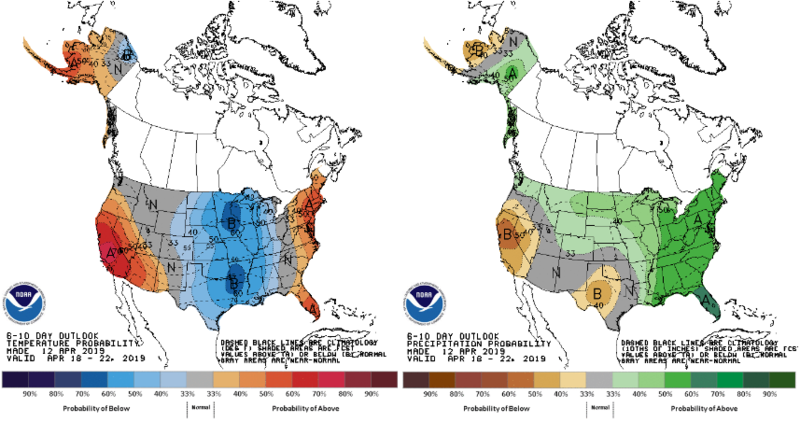 The CPC outlooks (6-10 day shown below) don’t provide much insight about the long term temperature or precipitation forecasts, and so the best we might do is expect the climatology: typical wet but warm mid-Spring. Backtracking to a short term forecast, I think there’s reasonable evidence of a weak perhaps warm shortwave brushing the area on Sunday, and some evidence of another stronger storm mid-week. Otherwise, keep an eye out for stray mountain snow showers through Saturday, but expect only moderate cloudiness with some sun. Snowfall continues in the Wasatch, finishing off a great season, but given gradually increasing temperatures and solar insolation, the season’s nearing its end. … it’s biking and golfing season, right? No point in skiing, no good snow to be found, stay in the valley, it’s April! Wait, it’s April. In Utah. April has a history of delivering big snow here! Did you know SLC has even seen measurable accumulations in June? The long and short of it: A deep, powerful, and progressive trough is progressing through today through Thursday with another shortwave poised to roll through behind it before weak ridging starts to return by the weekend. Ample synoptic-scale dynamics accompany this system, hence the significant valley rainfall we’ve been seeing today and the very steady and widespread nature of the precipitation. In addition, this trough is COLD! Like -10°C at 700 mb cold! Once the mid-level cold front pushes through this evening expect snow levels to finally drop to the valley floor. Moist northwest flow at mid-levels will boost the totals in the usual favored areas, though the low setting up to the east of the region will complicate things a little bit with the low-level flow. A lot to consider today, what an event! Rapid intensification continues as the system moves off to our east, sure to give the plains a spring storm to remember. 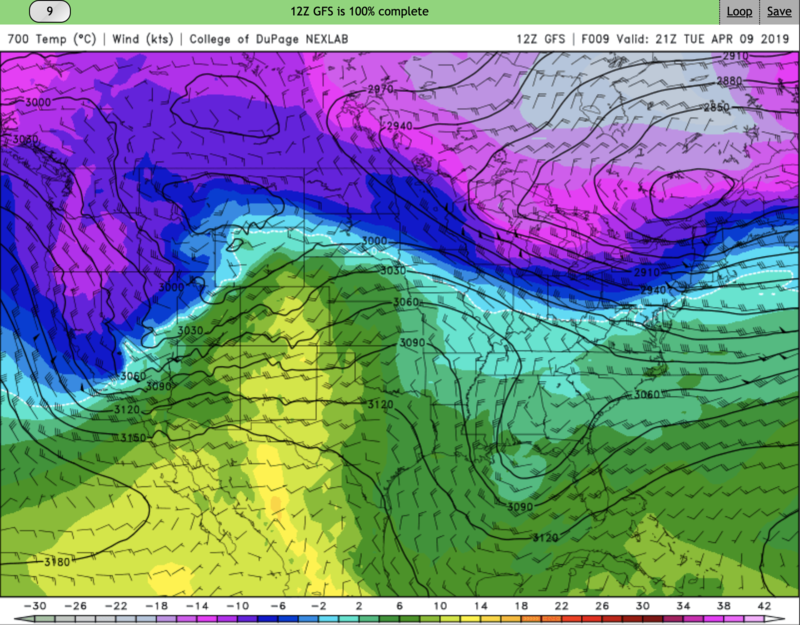 GFS 700 mb heights and temperatures for Tuesday afternoon. A strong mid-level front as evident in the temperature gradient is pushing through the region. The icing on the cake? Ok, this time it’s actually warranted to say this: Lake Effect (Lake enhancement, really)! 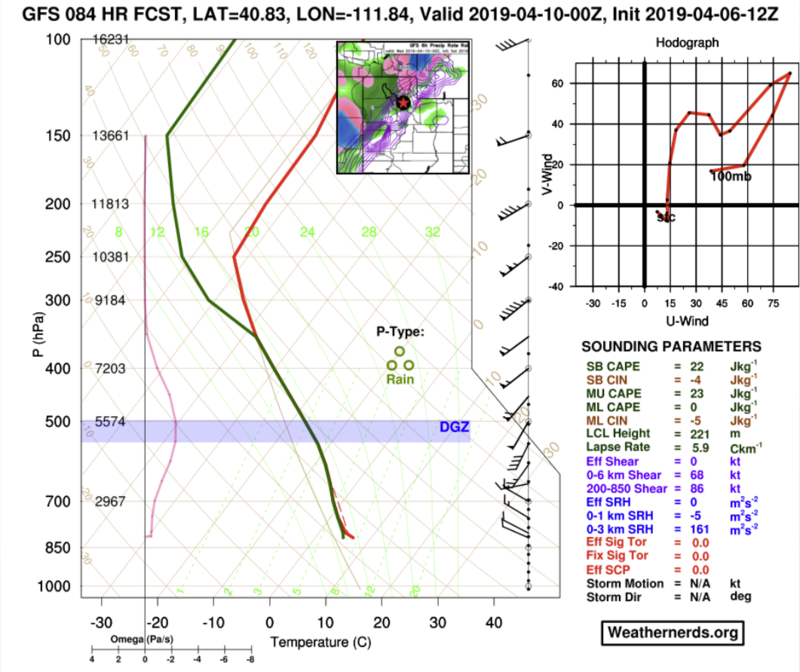 With the shallow lake primed and warm from the past week, and a still-moist cold airmass moving in over top, the environment will be ripe with instability and the lower levels will be near saturated. Narrow zones of the Salt Lake and Tooele valleys could see some snowfall totals that exceed the regional forecast if this happens to be the case. The impact on the Cottonwoods, however, will be marginal at best. Not much change from Taylor’s numbers here, sticking with 18-24″ in the Upper Cottonwoods. For those of you still touring from lower elevations on the Park City side, expect 6-8″ of snow down low, increasing with elevation to 18-22″ along the Wasatch Crest. With all the rain-on-snow and new snow on sun-crusted slopes please be avy-aware! Check the UAC forecast, and remember: if you don’t know, don’t go! 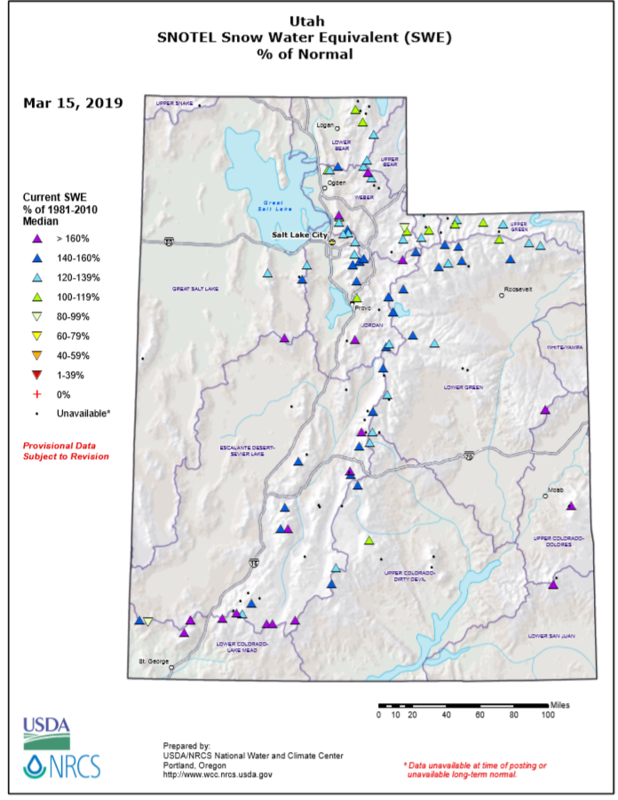 This weekend, resorts started closing up shop for the season, despite having an excellent April snowpack from base to summit (Looking at you, Park City, Pow Mow, and Deer Valley). For the resorts that are still open for a bit longer, another storm is on the way and will bring a healthy snowfall that will secure at least one more powder day. Tomorrow, southwesterly flow will bring cloud cover and moderate temperatures prior to the arrival of our next Pacific storm system. The trough will move eastward into the area tomorrow afternoon/evening with precipitation chances increasing as the day progresses. Forecasted 500 mb heights and vorticity is shown below. Plot is valid at 6 pm Tuesday with the trough axis is centered over Nevada. Precipitation will start as a rain-snow mix mid-day on Tuesday. The cold front is expected to move through Northern Utah Tuesday evening, with below-freezing temperatures forecasted all the way to the valley floor. This very moist airmass following the front will allow for snow to continue through the night at all elevations. 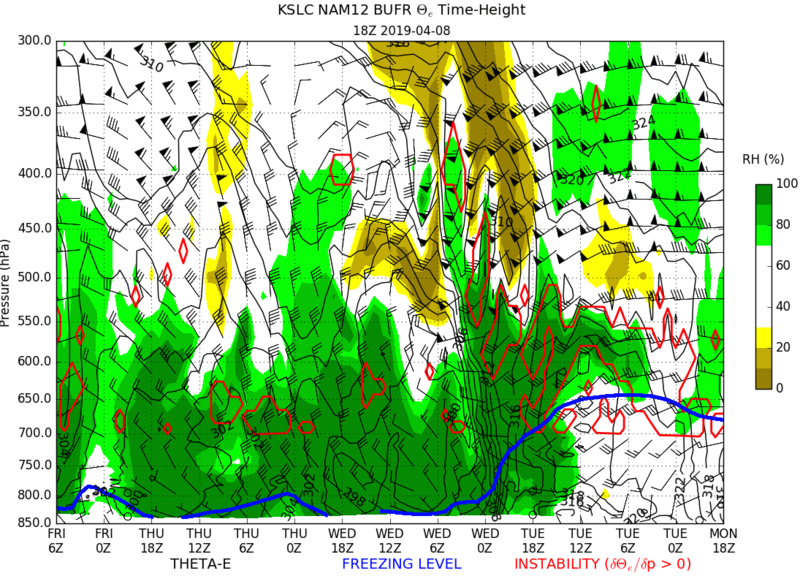 The cross section below shows the saturated air/high relative humidity values following the front. If you are still able to ski, enjoy the late season pow! A weak upper level trough entered our region last night and provided some ski locations with a few inches of snow, mainly in the upper Cottonwoods where Alta and Snowbird got ~3″. Snowbasin reported 1″ of snow. Today has been quite cloudy with some snow showers in some mountain locations as that same upper level trough exits the area. Don’t expect any more accumulating snow this afternoon and evening, though. Ridging will move in throughout the evening and into tomorrow and the early upcoming next week. Sunday should be beautiful with mostly sunny skies in all northern Utah ski locations. HOWEVER, a potent Pacific storm looks like it will move into our region by Tuesday afternoon/evening, with mountain showers possibly lingering into early Friday morning. This system looks to be quite a bit colder than the weak one we’ve been under last night through today. Even the valleys could see some snow as 700 mb temperatures could dip quite a bit as a cold front moves through Tuesday evening (see chart below). Ideally, to receive snow in the Salt Lake Valley you would need temperatures at least -7 deg C or colder. However, with heavier precipitation, the snow elevation levels often drop pretty low and valley snow can occur at “warmer” temperature thresholds. This looks like it could be the case for the Salt Lake Valley if the models hold up, with an outside chance of a fairly similar storm to the one we got last Thursday/Friday where heavy, wet snow brought down many tree branches and caused power outages in parts of the SLC metro area. In the mountains, there is not much uncertainty about precipitation type for this next storm as it should be all snow, basically throughout. There might be some ski locations that receive rain or a mix Tuesday afternoon for a brief time, but there should be a quick transition as the cold front approaches and passes through. Although it’s too early to say how much snow we will get, it does look like it could be a pretty exciting storm with heavy snowfall rates and plenty of powder to ski in come Wednesday and Thursday. We’ll have more updates regarding the upcoming storm for you lingering spring season powder hounds. In the meantime, have a safe and happy weekend! TLDR: A look forward at more snow as the season for snow sports closes. Scroll down for a probabilistic snowfall forecast covering this weekend. Most of us made the solemn realization that the season for snow sports is closing, but I hope this post can keep the fire going a bit longer. Ski resorts across Utah (*wink to Brian Head and Eagle Point*) had a great season, and the spring skiing forecast looks good, both short and long term. 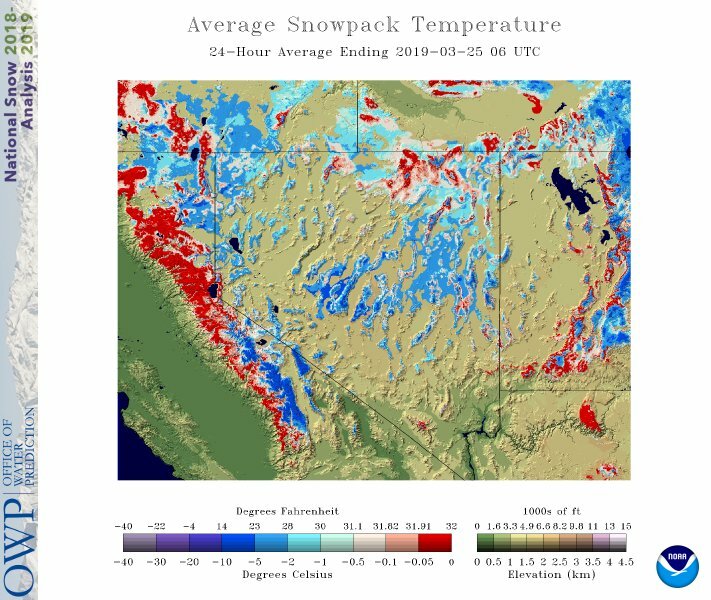 A view of select high-altitude (> 7k ‘) station datasets shows that most locations received substantially more snow than average this water year. Using Alta as an example (only resort I could find that records comprehensive historical snowfall statistics, get on this everyone else! ), and recognizing that the following numbers are reported by the resort, the local SNOTEL station recorded about 545 ” total snowfall since October 1st, 2018. Alta received more snowfall this season than 6 of the previous nine full-length seasons. Furthermore, the 18/19 season surplus came primarily during February and March, leaving much for April skiers to work with. To elaborate, during the 8-14 day period (Fri. April 12 to Th. 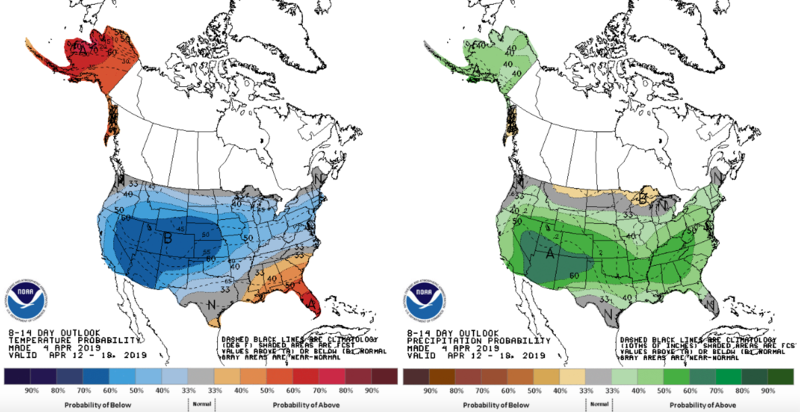 April 18), Utah is about 60-70% likely to see below-average temperatures (low-elevation average is ~ 45-55 degrees) and 50-70% likely to see above-average precipitation (Utah in mid-April already tends to be moderately wet). The 6-10 day period (Wed. April 10 to Sun. April 14) forecast is similar. The next storm hits Utah resorts sooner. In short, two mid-level lows merged in the past couple of days (not uncommon) beneath an upper-level low. An embedded and elongated shortwave trough then pivots around the upper low and approaches Utah from the southwest Friday night behind lots of moisture. Expect a moderate precipitation event for the area that will bring snowfall to the higher elevations (> 7k ‘). If you didn’t make it up to the mountains today to ski (or board)…well, that’s just a shame. It was pretty DEEP out there. A late season winter storm (which is very common here in Utah) paid us a visit yesterday and today, and dumped a good amount of snow on most Utah ski locations. It also provided a surprising amount of snow in some valley locations as well. I’m sure most of you know about all the downed tree branches and limbs and some of the power outages that made this morning’s commute a nightmare for some. As that system continues to exit the area, we’ll still see some afternoon snow showers in the Utah mountains (especially in the Cottonwoods) during the afternoon on Saturday. Some of the showers could be pretty intense with some even containing some lightning/thunder. Expect very little in the way of accumulation, though. By Sunday afternoon, ridging will slowly begin settling in (see 500 hPa vorticity chart below) and beautiful, sunny blue bird conditions should be present during the day. Temperatures should be very comfortable through the weekend (low to mid 30s) with little wind. The next chance for appreciable mountain snow looks like it could come next week on Tuesday evening as a trough moves into the Intermountain West from the Pacific. We’ll definitely keep an eye on that. In the meantime, enjoy the leftover powder this weekend from our recent storm! We will return to a couple of days of cooler and wetter weather to end the week and start the weekend. A weak band of precipitation moved through the area this morning, but any accumulations were extremely light. As the day has progressed the higher cloud decks have headed toward the east and we have been left with some fluffy cumulus clouds from daytime heating. GOES True-color imagery showing cumulus clouds over the Salt Lake Valley and the Wasatch Mountains. The band of precipitation that will be impacting us later this evening is currently located in eastern Nevada. (College of DuPage NEXLAB Satellite and Radar). We are expecting rain and snow to move into the area later this evening around sundown. This area of precipitation is currently coming together over eastern Nevada – visible by the bank of clouds in the above animation. We could see some thunder and lightning as the main portion of this band moves through as well. A moist lower atmosphere with some clearing and a bit of northwest flow should keep some instability snow showers going throughout the day on Friday. Snow amounts through Friday should be a nice revival to the spring snowpack. 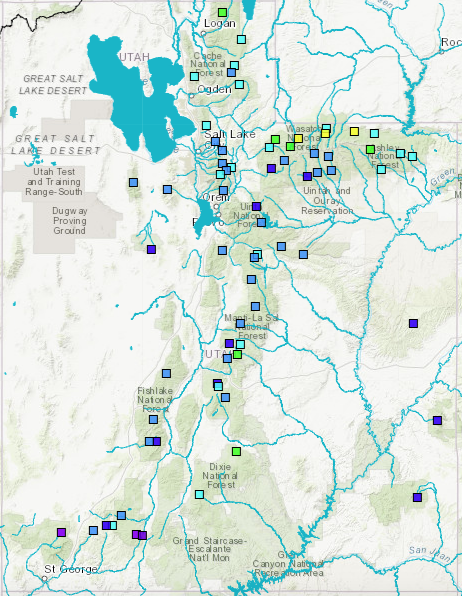 The upper Cottonwoods can expect about 6-12″ with locally higher amounts possible. Park City areas should fare decently as well, especially at higher elevations, with 4-8″ expected. Snowbasin and Sundance aren’t likely to see as much accumulation with about 3-6″ and 2-4″ expected, respectively. Winter Weather Advisories from the National Weather Service were just issued for the mountains, Wasatch Back, and SW Wyoming from this evening through mid-morning Friday. Valley locations should remain rain, except for a short period when snow could mix in and lead to light accumulations (especially on benches) Friday morning. Expect somewhat quieter conditions for the weekend, but some light snow showers remain possible at times (mainly Saturday). A little bit of a rebound in temperatures is possible early next week, but winter doesn’t seem to be over anytime soon for our mountains. Ensembles are suggesting another storm for the middle of next week followed by an unsettled pattern for several days thereafter. TLDR: Calm and warm weather this week takes a break while a cold front brings light or moderate snowfall to Utah resorts. Scroll to the bottom for a snowfall forecast. Alta’s Rustler Lodge employees taking full advantage of springtime conditions. Once weather in Utah shifts to a familiar springtime feel does it really go back? Seems so this week. Two systems currently sit over the Pacific and will disrupt the springlike weather we’re having. 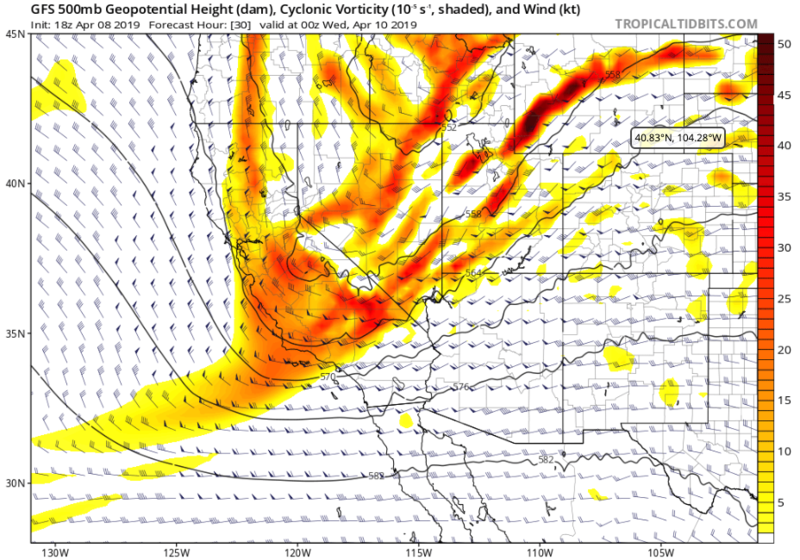 I’ll talk about the first system just off the Pacific Northwest coastline in this post. The other stays in the Pacific until at least the next work week. You might have noticed cloud cover building overnight last night and throughout the day today; you can see the recent increase in cloud cover in the satellite clip. The storm itself is a cold front that is now reforming and strengthening over central California. The storm moves toward the east-northeast, i.e., Utah, over the next several hours. Timing: Thursday 3/28 12 PM MT through Friday 3/29 6 PM MT. The heaviest precipitation will fall when the cold front passes around midnight Thursday night. Temperature: To start, expect a mild kickoff with snow levels at about 6500 feet. Low-altitude bases like Sundance will probably see rain during the first part of this storm. Snow levels fall to 5500 feet by midnight Thursday night, then past 5000 feet by Friday morning. Urban areas will be cold and above freezing during the event. However, expect to drive through a slushy transition zone through much of the canyons. Wind: Crest-level winds could be somewhat breezy Thursday evening leading toward midnight. Nothing outside of the norm, however, and perhaps even calmer than average winds at resorts. Given the timing and strength, gusts shouldn’t be an issue for skiers. 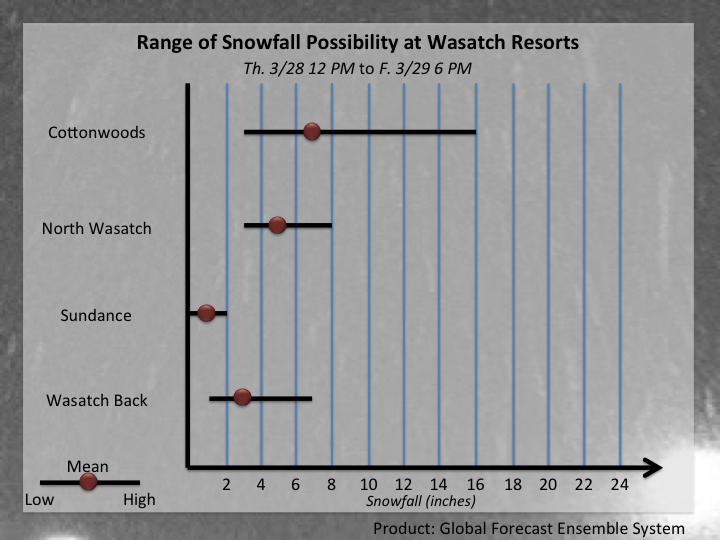 Subjective snowfall forecast for resorts in northern UT. The break from warm weather ends before the next work week. Mild weather then seems to continue into the foreseeable future. The weekend brought another foot of snow to the high mountains, and some snow all the way down the the benches. 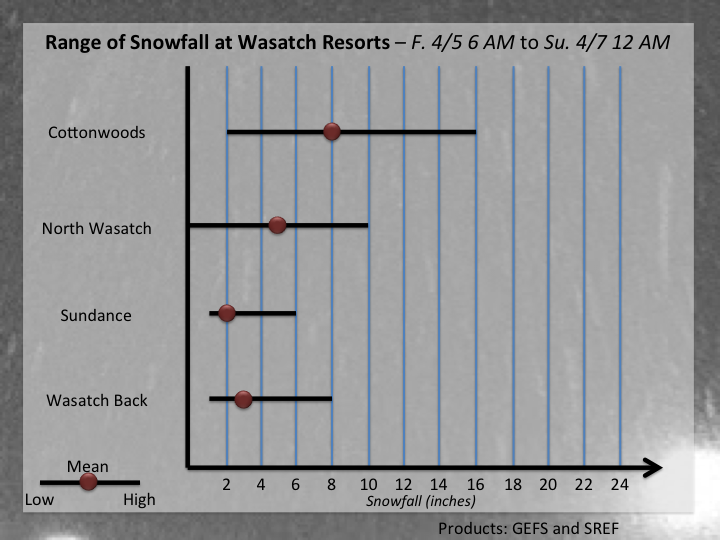 Snow rates were especially good early in the morning Sunday when 2″ per hour was falling for a bit at Alta. This was some dense stuff though, as tends to happen later in the season. After that storm cycle, a high pressure system moved in, and now it’s sunny and quickly warming. Spring is definitely here in the valleys. The temperature has been flirting with 40°F in the upper Cottonwoods, and it’ll push 50°F over the next 2 days. Thankfully temperature doesn’t have much impact on snowmelt rates, at least it’s dwarfed by the impact of the sun. The sun is as strong now as it is in mid-September. The snow pack on the back side of the mountains is ripe, but the higher elevation still have time. The next storm is Thursday. High clouds will start tomorrow, and their bases will lower going into Thursday. Right now it looks like the cold front will come through in the morning, and most of the precipitation will be with the front. The Cottonwoods are looking at 8-12″ of snow, and snow levels will be around 6000′. I’m somewhat worried about a dust storm coming before the cold front. Strong south winds will start overnight tonight, and the longer they blow the more dust gets in the air. However, we did just have a soaking storm, so hopefully the soil stays put.